This was late afternoon just a couple hours befor the sun went down. The light wasn’t that great. It was a sunny day and the waterfall was in the shade. So I decided grab my 70-200 to get some finer detail. And to under expose the shot a bit to loose the rock, and really make the waterfall standout. The photo was shot with my Canon 6D Mark II, with a canon 70-200mm f4 lens. Normally I use a tripod for landscape photography but I skipped it for this one because I wanted to stop the water completely. So I could shoot it handheld with the fast shutter speed. I live in Seattle. And we had just had a snowstorm roll though witch is rare if you’re familiar with the area. So I wanted to go capture Snoqualmie Falls in the snow. When I arrived, the sun was out in full force making a full shot kind of boring. So I opted to use the telephoto to capture the details. All the post processing was done in Lightroom. I wanted to make the waterfall the main focus and create a lot of drama in the image. So I dropped the exposure about a half a stop, and pulled back the shadows, dropped the blacks. To make the waterfall stand out. Then I bumped up the highlights and the whites to add some contrast. The. I did a radial filter around the waterfall to bring the exposure up a bit to really make it pop. After that, I cooled down the white balance to make it feel as cold as it was. I always have two camera bodies. My 6D Mark II, and a 77D. I always have a tripod, a canon 17-40 F4L lens, the Tamron 24-70 F2.8 g2, and the Canon 70-200 f4L IS. I also keep a set of graduated Lee filters, and a ten stop ND. 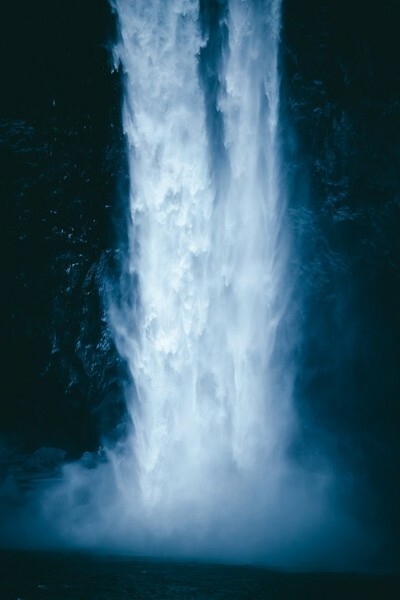 if You’re using a telephoto lens to capture a waterfall keep you eye on your shutter speed. And have a tripod handy if you want to capture some motion. I tried a bunch of different things while I was on location. I did long exposures of this with a ten stop ND (tomake the water really smooth), I did some at a 15th of a sec (to give it some motion), and I did it with a fast shutter (to capture all the detail in the water). When reviewing the shots I ended up likening the fast shutter speed the best. So always experiment and see what you like the best.